The early 1920’s represents a time in American history of great growth and change. The same can be said about Indiana University during the same period. 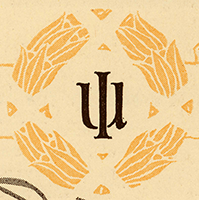 In 1920, Indiana University established the School of Commerce and Finance, now known as the IU Kelley School of Business. One year later, the School of Music was established, now known as the IU Jacob’s School of Music. Both of these schools now are regarded as leaders in their fields, both ranking in the top 20 among all institutions. In the mid 1920’s, Indiana University’s first two on campus dormitory’s were built. In 1924, the all-men’s dormitory building, Washington Hall, was built. This building is the first dormitory constructed on the current Indiana University campus. Also in 1925, marks the first year where the Old Oaken Bucket trophy was presented to the winner between Indiana University and in-state rival, Purdue University. Although this game ended in 0-0 tie, the Old Oaken Bucket game has been played every year since. In 1951 began one of Indiana Universities most recognized traditions, The Little 500. The Little 500, founded by Howdy Wilcox Jr., attracts nearly 25,000 fans each April and has been called “The Worlds Greatest College Weekend.” Also in the 1950’s, Indiana University is responsible for taking large strides in dental health. Three researchers from Indiana University are credited for the invention of a fluoride toothpaste recipe, now known as Crest.The royalties paid to the University during that time helped establish the Oral Health Research Institute at the IU School of Dentistry in Indianapolis. 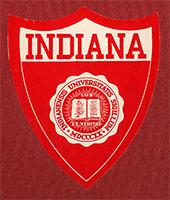 Appearing on mid-court of Assembly Hall from 1976 to 1995, this logo was around during the most dominant eras in Indiana University basketball history. The Hoosiers record was 236-36 during this time, winning 8 Big Ten Championships, appearing in 4 Final Fours, and winning 3 of their 5 National Championships. The 1976 Indiana University Basketball team was the last National Champion to have an undefeated season and is regarded as one of the best teams in NCAA history.